US 27 north to Oxford, OH thru College Corner, IN, L on Stone Rd, L on Solar Drive. House on right. 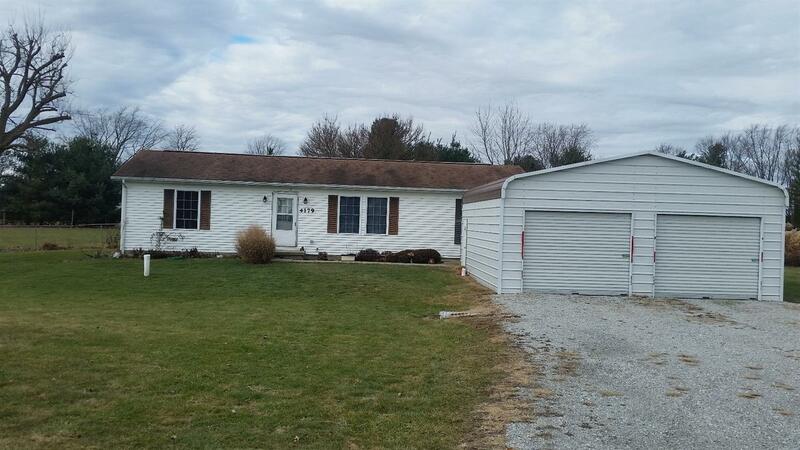 Attractive 3 bedroom ranch at the end of a small country neighborhood road. Built 17 years ago. New paint & carpet; fenced rear yard perfect for pets; located just off US27 south of Liberty, IN & north of Oxford, OH. A good location to come home to enjoy the beauty of a rural landscape from covered patio. Priced right & ready to move into. NOTE: This property was sold on 3/3/2017 and is no longer available. The details listed below are believed accurate to the date of the sale and are subject to change. Liberty was the home of Bob Jenkins, the radio voice of the Indy 500. Liberty is the star attraction as the county seat of Union County, Indiana located about 41 miles northwest of Cincinnati. The town itself is less than a mile wide but its packed full of everything county residents need from banks, to hardware and insurance companies. Just over 2000 residents call Liberty home, ensuring that there’s plenty of room to call your own. This is primarily a farming community, and Liberty is where social, political and entertainment needs are met. Housing ranges from farmhouses to turn of the century construction. Liberty sits at the intersection of US 27 and St. Rt. 44. Liberty Fire and EMS serve the city. Hospital services are found at the McCullough-Hyde Memorial Hospital located in Oxford or Fayette Regional Health Care hospital in Connersville. Liberty meets all your daily shopping needs. Be sure to stop by Bertch’s Do It Best Hardware store which has been in operation since 1866. For a more extensive shopping trip, you’ll need to head either to Connorsville, or south into Northern Cincinnati’s Northgate Mall. Wide-open spaces allow Union County residents the space to tackle any outdoor pursuits with boating at the top of the list. Quakertown Recreational Area, and Whitewater State Memorial Park’s 200-acre lake offers access to the 5200-acre Brookville Lake as the primary spot for recreational boating in the region. Hueston Woods State Park, less than 20 minutes away, offers miles of scenic hiking trails, fishing and boating, an 18 hole golf course, naturalist programs, a nature center with a display of live animals and much more. The Union County Speedway offers racing through the summer months for car enthusiasts. Golf enthusiasts use either Buck Point or Liberty Country Club. Miami University's campus in nearly Oxford offers a wide range of cultural, educational and athletic events too numerous to mention. This listing courtesy of Christopher Owens (513) 315-5146, Coldwell Banker College R.E. 513-523-2181.